Out of my hands. With Butterfly and the Coneflower completed, and all eight images sent to David Miller (http://www.houstongicleeprinting.com/) to work his magic, I’m taking tomorrow off. The eyes demand it. 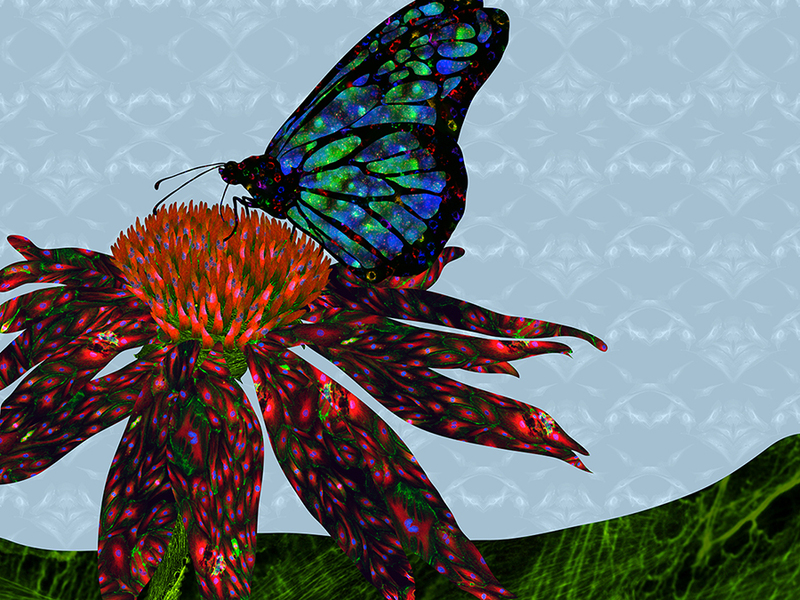 I created Butterfly and the Coneflower with microscopy images of blood vessel cells. This entry was tagged arts, blood vessel cells, cell artwork, cell images, endothelial cells, microscopy images, Nancy C Qutub, Nancy Qutub. Bookmark the permalink. Gorgeous work, Nancy. I think it is a masterpiece. Thank you, Pam, for your kind comments. I am pleased with the butterfly.